From my Facebook and Instagram posts, it’s no secret I have become a crazy cat guy with 3 awesome cats. Unfortunately with that, comes lots of cat hair! 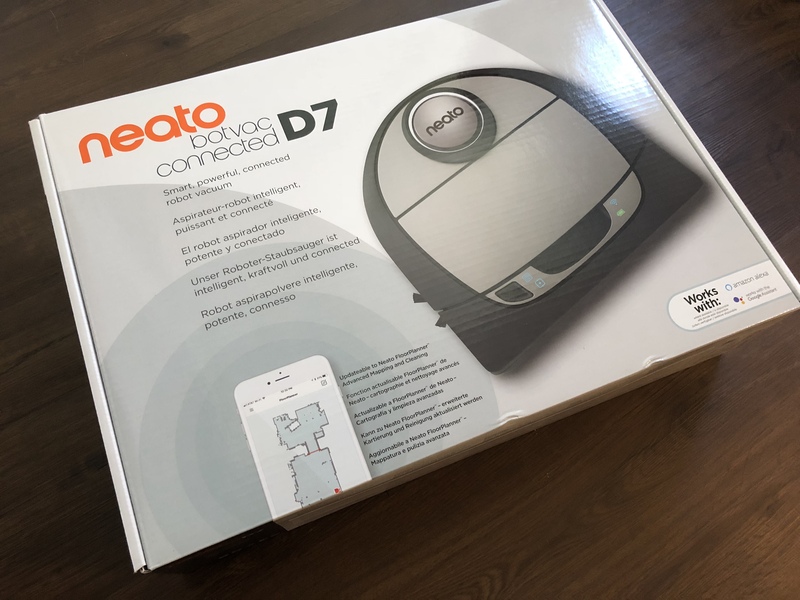 You may recall my previous blog about the Neato Botvac Connected, one of (if not the first) Neato Botvacs that was smartphone controllable with an app. I’ve had that vacuum for years and through 3 homes and it has been a life saver. In my current home in Georgia however, I have 2 floors, so I had been carrying it between floors to do its work. So, enter the D7 Connected. The top end Neato robot vacuum. I’ll get right to the point and tell you why I just had to have this vacuum. When you have a lot of rooms in the house, its easy to have left something on the floor in one, that could really mess up a vacuum. Clothes, tools/parts, whatever mess you can think of. Originally, to stop the vacuum from going in a room, you’d have to 1) buy electronic devices that go on each side of a door. This is how Roomba was doing it, and I was always worried about battery life, and how easily my cats could knock them over. Alternatively, 2) what Neato did, was make magnetic strips you could just put down on the floor. I liked this a lot better, but I had to be careful in applying it in rentals to be non permanent but effective. All those issues are gone however with the new No Go Lines in the Neato app. You take the time to clean the whole house of major obstructions, open all the doors, and let the Neato D7 map out your house. Then, you can draw in no-go lines anywhere from your phone. Remember you left something on the floor in the spare bedroom? Just draw a line before you click run, and Neato won’t go there. Super awesome, super simple! You can also have the robot remember multiple floor plans, if you need to clean different floors in your home. Clearly one of the most important parts of a vacuum, right? Neato leaves nothing on the table here with super power suction. With the great combo brush included, picking up pet hair and larger debris from both carpet and our wood flooring is a breeze. I’m always amazed when I open the dirt trap what I see! On a side note, it’s also really quiet for the power of cleaning you’re getting. I borrowed this quote from a Wired blog, it seems spot on! I measured the sound of Turbo mode at 67 dB and Eco at 64, so I opted to go for turbo mode. Sure it’s louder, but it’s still more than ten decibels quieter than the Roomba 980. Pet hair, small debris, no problem! This feature I jumped the gun a little bit on, because it’s still to come, but how perfect is this? With zone cleaning, I can frequent the kitchen moreso than my office or bedroom, to pick up those spare crumbs that hit the floor in cooking. Maybe I should hit the living room extra too from that movie night popcorn! I took this image from the Neato site, but I can’t wait to explore this feature! The video below gives me such relief to my OCD. Look how straight the cleaning is, as lasers permeate the room and the D Shaped Vacuum squeezes into every corner perfectly for a wonderful clean! Battery life is definitely important to me in a robot vacuum. While my original Botvac connected is awesome, my new home is just a little bit bigger, so it can’t quite squeeze the whole floor in, in one cleaning. That means it pauses near the end to charge, and then starts back up to finish which only takes it 10-15 minutes. The new D7 however has 2 hours of battery life so it easily knocks out the job! Plus, it has turbo charging speed, so if I need to spot clean or do something else, it will be ready to go again shortly! Perhaps you have some furniture you want to give some TLC, or maybe you don’t want Neato bumping into walls or doors. Don’t worry, Neato has you covered there too. You can enable gentle mode, and Neato will more cautiously approach corners, walls and obstacles. Setup was a breeze! Just a push of a button, and connecting to the robot’s WiFi from my phone and we were off to the races. There was a software update that came and went really easily, too. Took me under 5 minutes to be up and running. Can’t beat it! If you’re a tech nerd like me and have two robots, on two floors, and you’re worried about it being complicated to manage, let me put those fears to rest! As I showed in the video above with voice control, Neato was thinking ahead, and the app experience is really good and intuitive for controlling multiple robots.